Should another strong earthquake strike Bhutan again, the damage to cultural heritage sites are expected to be minimal. That’s because a guideline for improving resilience of heritage sites is in place now. The guideline, which is in its draft stage at the moment, was developed by the Department of Culture in collaboration with relevant stake holders. The World Bank Disaster Risk Management based in Tokyo, Japan provided support in developing the guideline. A Disaster Risk Management Specialist Coordinator with the World Bank Disaster Risk Management, James P. Newman, said it is not only about safeguarding heritage sites but also protecting lives. “The second that I felt was really interesting and really important is the recovery process where it’s very important to have cultural preservation aspects in mind to understand exactly where a Dzong is, how it was built, how it was used and how the current monk community wants to use it in the future,” he added. 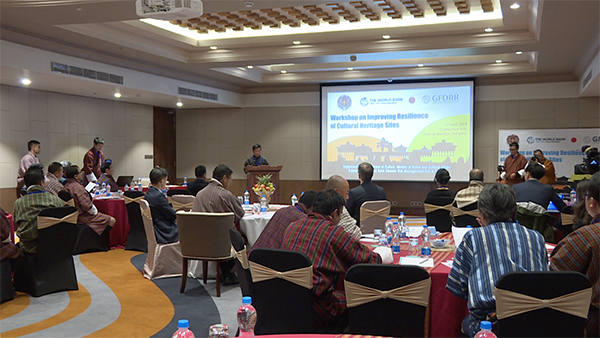 The guideline covers pre-disaster monitoring and preparedness plan and post-disaster response system. Six principles under pre-disaster and post-disaster plan have been identified based on the past and current experiences. The guideline will prove handy to government agencies, communities and stakeholders connected to cultural heritage sites. It will help in identifying risks, and conducting regular monitoring and maintenance. It will also ensure immediate response and recovery activities. With the guideline in place, relevant stakeholders will conduct regular mock drills for effective evacuation of nangtens or scared relics, set up warning stations in hazard areas and put in place fire safety management among others. Emergency response training will be provided to DeSuups and other relevant agencies. Also, as a way forward, the culture department will develop a risk mitigation plan for Punakha Dzong. “We would like to take on a very important site, which is Punakha Dzong, and prepare a mitigation plan as per the disaster management act, which states every dzongkhag should have a disaster plan and a contingency plan,” Nagtsho Dorji, the Chief Architect with Department of Culture said. The department will further refine the guideline and submit it to the National Disaster Management Authority (NDMA) next month for endorsement.